I am so missing England! Seeing your weather update makes it worse. As to hands, mine are looking really bad right now and you know I have a little event coming up next month where someone might notice my hands. I am missing England too right now! I had a hard time with dry skin in England and now here at home in Utah. There isn't enough lotion in the world for my dry winter hands. Dori I hope you have a wonderful Wednesday. It is cold here too, burr. Good luck on helping your poor hands, Dori. It's cold here too, but luckily, my hands haven't gotten all chapped. My face however, is a different story! Wow, that looks painful. Try some Johnson baby cream. That is what my mom use to slather on us before we went skiing in the Alps. It really protected us from windburn and chapped skin. I've never made my peace with cold weather. It finally warmed up here today - around 60 or so, almost normal. But it's gonna get cold again. Sorry about your hands. Winter is here too. The roads are awful and it's too cold in the morning to walk the dog. Her little feet get too cold. Take care of those hands. 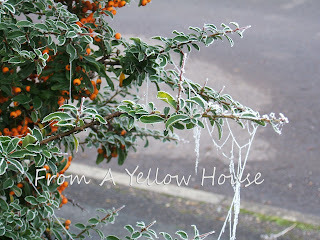 I love that spider web frosted over!! We get lots of ice and snow in Kansas (snowed last night) but I have never seen a spider web like that. Your hands look like mine right now and yes it HURTS! Cute ring though! I keep an eagle eye on the weather in England, so I know what it's like right now. I think a pair of warm gloves would be perfect for your hands, but not before a good massage with hand cream to bring them back to life. Winter is a time for hibernation indoors looking out of the window, unless you have to go out to work of course. I bet olive oil would bring those babies back to life, especially after you have slid on some thin plastic gloves. I hate dry skin, it makes me feel like an alligator. We don't have the cold, cold, weather yet...just lots of rain so far, which I love. Oh, btw, I love the spider artwork! Wow! Sorry to hear about the skin problem. Find yourself an aloe vera based lotion or cream and that should help. Lovely pic, and yeah, it must be hard for a Georgia girl to get used to the UK climate! OMG! Stay warm, Dori. And get some moisturizer going for your poor hands, k? We're expecting 6 to 8 inches of snow here tonight so winter is definitely here too. I loved seeing your photos. As to your hands, they sure do look like they are suffering from winter cold. Here in Vermont, we use a home grown product called "Bag Balm." First was used on cows but it's the greatest thing in the world for keeping hands moisturized. I think you can find it online. I hope you and Brit Boy and Trevor have a great weekend! I have a friend of Indian descent and she makes her own lotions in the winter. I don't know what the heck she uses, but I wonder if you could google and find a holistic sort of remedy. I swear she uses Rose Petals as one of the ingredients. Hi! 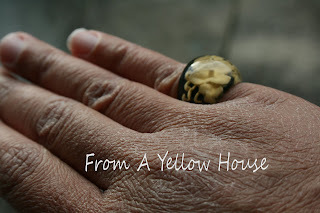 Thanks for dropping by at my blog. My hands look like that when soaked in cold water for so long like during washing clothes. I am sure that it would be smooth again. Winter is harsh on skin. You get all scaly, itchy, and leathery. Every year my whole winter skin care routine has to change. Glad you liked the pics. Yeah, I've had the cracking and bleeding. Oh now see if we got a bit of snow for the weekend I would love these chapped hands. LOL. Have a great weekend. I'm not a winter girl either :) I know what you mean about re-moisturizing being a chore. Ooh, I may have to try olive oil too. I have been definitely feeling like an alligator lately. LOL. Glad you like the spider web. It was so unexpected :) Have a great weekend! I will try the aloe vera lotion too. I figure all this great advice is too good to pass up. I will definitely keep warm...I'll see what Brit Boy can do :-)Have a great weekend! Thanks for the tip. The idea of rose petals just sounds so lovely and romantic. I will have to do a bit of research. I probably have a touch of dishpan hands :) Thanks for the vote of confidence. Yeah, winter is tough. You get prickly being in the heat inside and then outside you get windburn. That's why spring feels so good :) I will have to adapt my skin care routine better too. Can't turn alligator :) Have a great weekend!